Golden Age of Vancouver Canucks hockey. exciting young defensemen away like goody bags at a children’s birthday party. it just may be the last great move of the Gillis era. on Stanton? Find out on the other side of the jump. expect a third pair defenseman to be used. attributable to luck, or prone to percentage regression. his overall strong .529 corsi for%. *Need help understanding these fancy stats, click here. play, Stanton significantly exceeded expectations across the board. team needs at a reasonable price to fill out their roster? pay day in the summer. He surprised us all last year. Can he do it again? Editor’s Note: with a new season comes a handful of new faces to Canucks Army, and some big changes to the blog. We’re expanding our writing team this year and adding a couple of fresh faces, including MoneyPuck, who wrote the fantastic Deep Dive series this past September. Follow him on Twitter here, and stay tuned for more announcements regarding our upcoming season here at Canucks Army. Exciting times! I’m sceptical about using WOWYs with players whose usage was so different. Stanton played some of the softest minutes on the team, so as with, say, Richardson they’re probably not particularly relevant as an evaluation tool. (Not a criticism btw – WOWYs are obviously part of the format of this series and you haven’t drawn any outrageous conclusions from them either). It will be interesting to see how he does being shackled to Sbisa/Weber this year. As bad as Bieksa can look at times away from Hamhuis, he and Stanton formed a very effective duo. Does Bieksa get some credit for Stanton looking so good? or does that point to Stanton an effective “enabler”. Time will tell. When Stanton was exposed on the waiver wire I remember a lot of Blackhawks fans thinking it was a poor move as it was mainly to protect Kostka who was subpar and eventually shipped to TB I think. 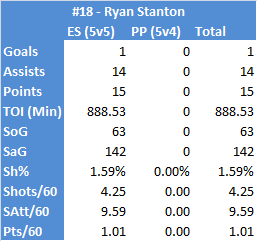 Stanton had been a pretty solid player for their AHL team. I think he had more of an impact on Bieksa than vice versa — Bieksa looked terrible without him. If we were going purely on performance and not the need to make certain trades and signings look good, Stanton should clearly be our 4/5 d-man. He’s also had decent if not spectacular production from the back end, I wonder if he can translate that at the NHL level with better usage. For some reason, people want to ignore the successes that transpired during the Tortorella era (there were a few). 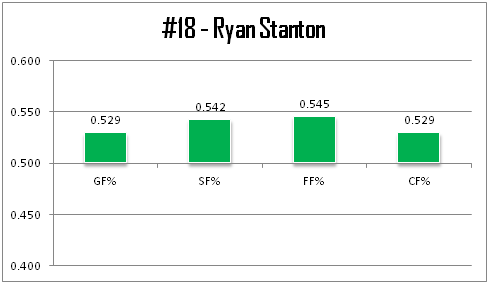 Stanton had his best year as a professional under Tortorella (not necessarily because of him, though). Santorelli had a comeback year. Kassian, Tanev & Lack all progressed in some respect. Overall, the team had respectable 5v5 & 5v4 possession numbers and even cajoled a respected scribe to write about ‘Safe is Death’ coming to Vancouver (something that was a criticism of the AV era). I don’t disagree with your general argument about coaches as “middle managers” insofar as they will be as successful as the personnel they’re provided with. But I do think there is something rather shocking about the lack of professionalism with which Tortorella approached his job — I don’t care about the temper or the yelling (though it provided an unnecessary sideshow). I agree with you that putting last year down to a Tortorella effect alone is wrong; but are you really suggesting that it doesn’t matter if the coach actively ignores key players, doesn’t bother practicing important elements of the game, and is disinterested in showing up for work at the same time that they are demanding a strong work ethic from their players? You’re right to say that it’s not enough to simply point the finger at Tortorella but I think in using the “middle manager” argument you are effectively letting him completely off the hook. Santorelli’s comeback had much more to do with his own hustle and desire for a contract and roster spot than anything Tortorella did (and I remember him fading somewhat before he got injured) while Tanev and Lack’s progress was arguably hampered by misuse by the coach (you could similarly argue the Sedins prospered under the first few months of Tortorella until the inevitable overuse broke them down). Trust me, there are many things I didn’t like about the Tortorella era. I never wanted somebody like him (or anyone in the Carlyle/Keenan mold) as a coach in the first place. It’s the catch all “Tortorella affect” that people are using as an after the fact explainer for all that ailed the Canucks last year that I find ridiculous. Where were these criticisms of Tortorella last October? A number of the typically-less-delusional on here were frothing over the possession numbers for the first half of last season without looking at the why (inflating these numbers while down by one on the scoreboard and overusing the top of the roster during the first half of the year). And now all of a sudden Tortorella is being scapegoated for the ENTIRE season along with the fundamental issues that still plague this roster. As I’ve said before, it’s not so much about the middle manager having zero impact. It’s about pretending that from the comfort of our couches we can understand the non-tangible effect a coach has on players. Or that Desjardins HAS to be an upgrade on Tortorella simply because he (probably) won’t charge the opposition’s dressing room and he converses with players. The Canucks are pretty much making the same (dumb) bet they made last year: expecting more from an old core with limited upside on the roster. While the fans may be working with that approach, the actions of GMJB suggest that he’s giving them one year to perform. There are some who called for a full rebuild, even though Benning was hired less than a month before the draft. I think it’s both reasonable and opportunistic to let our assets play and assess/increase their value before trying to offer them up. Yes, I think that’s all pretty true. As someone who clung to false hope for too long last year, I’d have to agree with the basic premise of the other CA article on the true value of the Tortorella era in opening eyes and lowering expectations, though again I think the pendulum can swing in the opposite direction (as I think you’re intimating) and giving too much of a pass to the current management. I hope for the best with the Canucks this year but a dogfight for a playoff berth is more likely. Regardless I’m excited for the start of the season and to see some meaningful hockey. I wish the Canucks would steal away a scout or two from the Blackhawks, instead of waiting till they need to waive a player. The Gillis era WAS the Golden Age of Vancouver Canucks hockey. It’s the notion that many of you rubes held (and perhaps still hold) that Gillis WAS the reason for the Canucks success during his reign with which I took (and still take) issue. Wow. Had no idea that Stanton’s fancy stat numbers were so impressive. If he can be an effective third pair guy that plays ~15 minutes and kills penalties, I’ll take that win. That leaves one of Sbisa or Weber to claim the #6 spot, my money is on (non Shea) Weber. We know that Stanton is a very very good 3rd pair player. Can he take another step while playing in tougher minutes? We’ll find out. While WOWYs are a little weird when comparing varying players and usages, I find his WOWY with Bieksa the most illuminating. This was his most common partner and his most common usage. 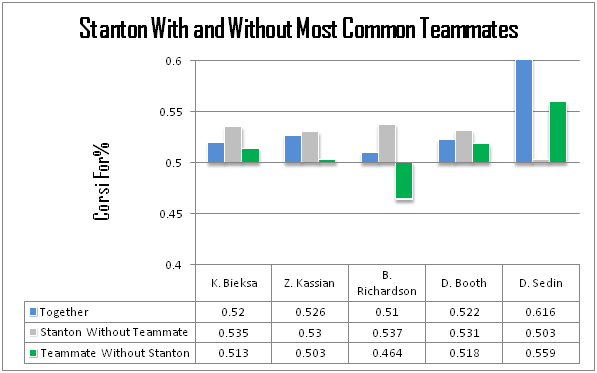 Bieksa was worse without Stanton and Stanton was better away from Bieksa. Bieksa’s drop in performance is partly due to tougher minutes away from Stanton, but Stanton was still effective in his limited usage away from Bieksa. That’s encouraging.